In the future, warfare is advanced. 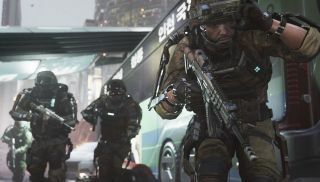 Hover-bikes, directed energy weapons, threat-detection grenades and powerful exoskeletons are just some of the tools available to those who answer the call of duty. You know what I'm talking about, right? It's the Call of Duty: Advanced Warfare "Future Tech and Exoskeleton" trailer! "The 'future tech' in the game is actually based on technology that we see today, and we've taken it further," Sledgehammer Games co-founder Glen Schofield explains in the video. "That's one of the things about Call of Duty, it's gotta be relatable, it's gotta be believable. But we are taking it to an extent that makes it also fun and new." Fun, sure, but new? I can't say I've seen anything quite like the mobile shield gizmo before, but the exoskeleton reminds me very much of the Crysis nanosuit, which provided players with greatly heightened speed and strength, and even an invisibility cloak. It was more stylish, too, although it was probably a nightmare when the call of duty gave way to the call of nature. Jokes aside, I'm looking forward to seeing how some of this new technology will impact online gameplay, which despite a recent emphasis on the single-player campaign is the core of the Call of Duty experience. How will the Overdrive mechanic work in a crowded multiplayer arena, for instance, and how will Sledgehammer avoid maps filled with people crouching behind portable shields? New gameplay elements invariably mean new complications, and it'll be interesting to see how they're handled. Call of Duty: Advanced Warfare comes out on November 4.